It is May 1941, and the free world is trying to survive the darkest days of World War II. Great Britain is taking an unmerciful pounding from Nazi Germany's war machine. Its cities are being reduced to rubble by Nazi bombs, and its economy is slowly being strangled by Germany's control of the seas surrounding the island nation. And now the Nazis are about to deliver the final, crushing death blow. Germany launches the mightiest battleship the world has ever seen. With cannons capable of propelling deadly shells as far as 26 miles, the Bismarck has the power to rule the seas and drive Great Britain to its knees. That's where you come in. Flying a prototype Grumman Avenger dive bomber, you are Great Britain's last hope. Dive Bomber, a flight/combat simulation by U.S. Gold puts you in the pilot's seat—and the gunner's and engineer's seats as well. It captures the drama and excitement of military battle as well as a good war movie—maybe even better, since you're actually part of the battle, not just an observer. The scenario upon which Dive Bomber is based is part fact and part fiction. The sinking of the Bismarck did in fact help save the British Empire. But Avengers did not take part in the battleship's destruction. Dive Bomber's instruction manual points that out. But unless you're a nitpicker for historical accuracy, the fact that there's some fantasy here shouldn't detract from your enjoyment of this program. Dive Bomber is, in fact, one of the best entertainment programs I've ever seen for the ST. The graphics are outstanding; animation flows smoothly and realistically; attention to detail is amazing; and game play is relatively easy to learn, yet intriguing and absorbing enough to ensure hours and hours of entertainment for your software dollar. The first indication of just how good a job U.S. Gold did comes in Dive Bomber's opening screens. The first one is a picture of an air/sea battle that is so realistic it belongs in some war museum. The image is accompanied by a musical score that gets your heart pounding immediately. But if the old ticker is a little sluggish, the next two screens should definitely provide the kick-start it needs. The first is a head-and-shoulders portrait of Hitler with a Nazi flag draped behind him. The portrait is accompanied by Hitler's digitized voice proclaiming (in German), "The Bismarck has claimed its first victim. Our navy will crush them!" Then comes a portrait of British Prime Minister Winston Churchill, whose digitized speech proclaims, "We shall fight on until the curse of Hitler is lifted from the brow of men." It's enough to send shivers down your spine. But try to stay calm, because what you'll have to do to fulfill Churchill's vow will require nerves of steel and a steady hand. It will also require plenty of practice, which you can get by selecting that option from the first Dive Bomber menu. That brings up another menu that allows you to practice one of the four flight training elements that comprise an actual mission: takeoffs, landings, combat flight training and attacking the Bismarck. Whichever training phase is selected, you'll have access to the four control screens used in a Dive Bomber mission: the pilot's, engineer's, navigator's and tail gunner's screens. You toggle between the screens by selecting Nos. 1 through 4 from the ST's keyboard. The pilot's screen shows the instrument panel and the view out the front of the cockpit canopy. There are controls that allow the pilot to steer, climb and descend; fire a .50 caliber machine gun; brake the plane when landing on an aircraft carrier; and load and launch one torpedo. Instruments show heading and attitude of the aircraft, wing flaps and rudder, plus remaining altitude, vertical speed, airspeed and ammunition. The engineer's screen shows only controls and instruments. This is the screen used to select fuel tanks and monitor fuel supply; control throttle and fuel mixture; monitor engine RPMs, temperature and oil pressure; raise and lower landing gear; and turn on and off the flight camera, ignition switch and landing and cockpit lights. The navigator's screen is basically a four-quadrant map (one quadrant is visible on the monitor at a time) that shows the location of land masses, mine fields, your aircraft carrier and enemy ships and fighter planes, as well as your dive bomber's location and heading. This screen also features a direction finder. 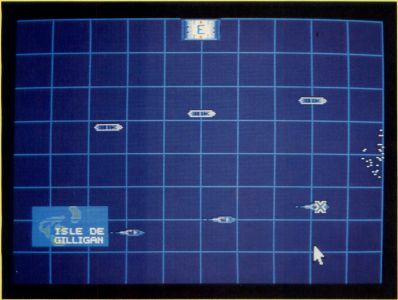 Select your target on this screen and a vertical red bar will appear on the compass in the pilot's screen, showing you which direction you must fly to reach the target. The fourth and final screen shows the view from the tail gunner's turret. A gauge indicates remaining ammunition, and a gun sight allows you to target incoming enemy fighters. 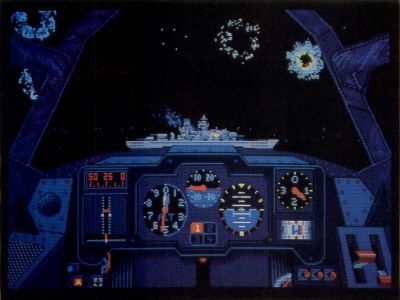 As is the case in the pilot's screen, the gun sight can be moved by joystick or mouse. Pressing the trigger button or left mouse button makes the gun fire. In the pilot's screen, pressing the right mouse button or the spacebar on the keyboard (if you're using a joystick instead of the mouse) toggles control between the machine gun and yoke (which controls the plane's movement). Contrary to many other flight simulators and combat games, Dive Bomber works much better with a mouse than with a joystick. The controls work much more smoothly, and response appears to be more accurate with the mouse. It's also quicker to toggle from machine gun to yoke using the right mouse button than using the spacebar. Generally, I prefer a joystick in this type of game because it just feels like the right tool for the job. But in this case, partly because two of the screens don't really involve maneuvering or shooting and partly because the response to the mouse feels more precise, I didn't mind using the mouse at all. You might find it difficult at first to undertake a mission. As in flying a real airplane, there are so many controls to monitor and so many elements to control that you need to practice, practice, practice. At the beginning, it helps to play Dive Bomber with a friend, who can perform certain tasks for you. It's easier for two people to conquer the split-second tasks. But as those tasks become more routine, it's quite possible for one person to do well at Dive Bomber. Not that it will be easy. Remember, there are four screens to monitor, and neglecting any one of them could put a quick end to your mission. To make things a little easier, each battle station features a "screen selection box," containing numbered squares corresponding to the various battle stations. A square will flash when your attention is required at a station. For example, if you're being attacked from behind, the tail gunner's square will flash, warning you to switch screens. You'll do plenty of switching during any one of the five possible missions. You "draw straws" to select your mission and have the option of accepting it or drawing for another. Even the simplest mission will be filled with screen-switching, trigger-poking, precision-flying action. All missions are flown at night, so there are only the stars and reflections off the water to indicate your speed and attitude. But the sensation of flying is a good one nevertheless, particularly when you're diving at a target or being attacked by enemy aircraft. The animation is also a treat. As enemy planes approach, they gradually grow larger, enhancing the realism. They actually look like real airplanes drawing closer, not just computer images getting larger. And when you hit one of those planes with your machine-gun fire, you can actually see it burst into flames. You can also see the effects of enemy fire on your own cockpit canopy. There are other details that enhance the enjoyment of playing Dive Bomber. Flip on the ignition switch and the on-screen image shakes as though it were the cockpit of a real fighter plane. And in order to see the controls in the engineer's station, you must flip on the cabin light. But make sure you switch off the light when you go to another station, or you'll be more visible to the enemy and more likely to get shot down. A mission (game) ends when you're shot down, forced to ditch your plane (because you ran out of fuel or sustained too much damage), or have accomplished your military objective. At the end of a game, an information screen tells how much damage you inflicted on the enemy and how much your plane and aircraft carrier sustained. Points are awarded based on your performance, and the top scores are recorded to disk in a "Pilots' Hall of Fame." Dive Bomber has earned a place in my own ST Entertainment Programs' Hall of Fame. It is one of those rare programs in which a lot of terrific elements blend together to form a whole that's even greater than the sum of its parts. My only gripe is that the two-disk program supports only one drive and therefore necessitates some disk-swapping. In a lesser program that might not be as annoying, but in one as good as Dive Bomber, even a few seconds spent swapping disks is frustrating because you'd rather spend that time enjoying the game.